March 5-- Mrs. Ruth Elder Askew, age 91 of Bartow, Florida passed away Friday, March 1, 2019 at the Rohr Home in Bartow. She was born in Johnson County, Georgia to the late Charles W. and Annie Laura Smith Askew on November 7, 1927. Miss Askew moved to Bartow in 1945. She was a member of Main Street Baptist Church of Bartow. She loved her Lord, her family and enjoyed her many friends. In addition to her parents, Ruth is preceded in death by two brothers, Charles and Gerald Askew, and a sister Sara Dees. She leaves behind: one sister, Ida Mae Wynns, Bartow, 5 nieces and 4 nephews. Graveside services will be held on Friday, March 8, 2019 at 10:30 A.M. at Westview Cemetery in Soperton, Georgia. Miss Askew will be laid to rest beside her parents. Her family will receive friends prior to and following the service, on Friday, at the graveside. 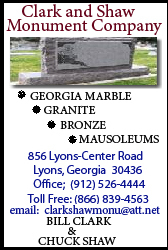 If so desired, memorials contributions may be made to the Main Street Baptist Church of Bartow, 1140 East Main Street, Bartow, Florida 33830. Sammons Funeral Home of Soperton is in charge of the funeral.